Heat the butter and oil in a large, heavy-based saucepan over high heat. Add the onions and garlic and cook, stirring constantly, for 22–25 minutes or until light golden. Add the sugar, flour and thyme and cook, stirring constantly, for 1 minute or until well combined. Gradually stir in the stock and vinegar, and bring to a simmer. Cook for 10 minutes or until reduced slightly. Preheat the grill. While the soup is simmering, place the bread on an oven tray and sprinkle with the cheese and thyme. Cook under the grill for 5–6 minutes or until cheese is melted and golden. 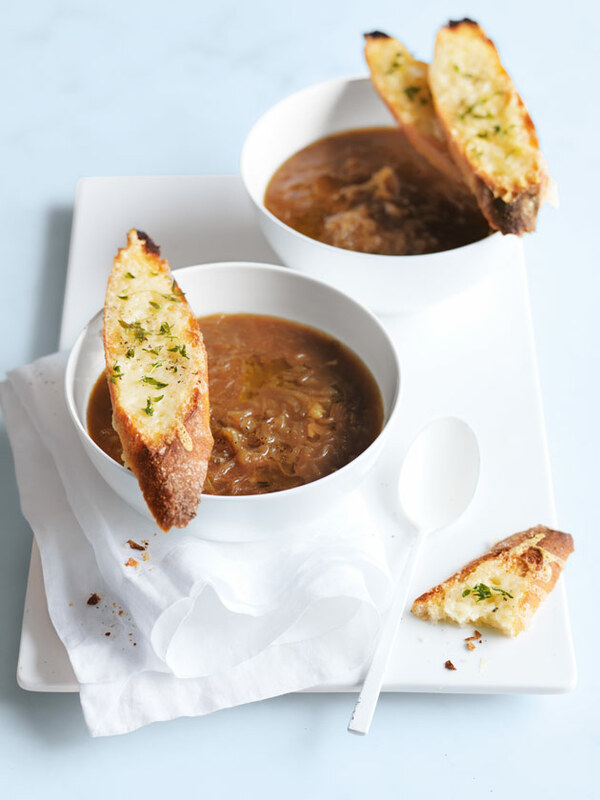 Divide the soup between bowls, sprinkle with pepper and serve with the bread. Serves 4.